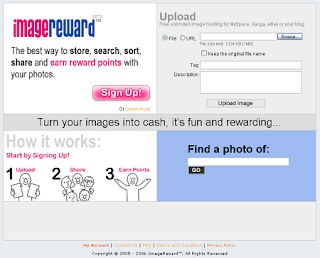 ImageReward is a free image hosting service, that allows you store, search, sort, and share photos, another feature is you can earn money or get gift via ImageReward. It is simple, just upload your photos as other image hosting site, you have personal gallery, you can set it private or public. If someone view your photo you can get reward points, that points can be trade for cash or gifts.